"Gulf of Mexico Oil Drilling Stymied by Regulation"
Onerous regulations, endless layers of red tape, restricted access to critical supplies of domestic energy and a lack of direction from government are only a few of the many examples of artificial barriers that paralyze business and make it difficult for America to grow and prosper. Is any of it true? Not much. The criticism of lacking a coherent energy policy and direction hits home, especially in the haphazard and half-hearted support for renewables, but otherwise Big Oil and its shills are largely getting away with doing as they please, same as always. Yeah, they doth protest too much. Getting a clear picture on US oil supplies and the various products refined from oil is difficult because it is an exceedingly complex mix of sources, products, technologies and supply chains. 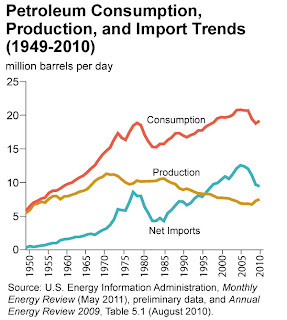 The chart at right from the Energy Information Administration (EIA) provides a useful big picture. Petroleum consumption has fallen since 2005 due to increased energy awareness by the public, shifting energy sources, and of course diminished demand from the still-sputtering economy. This lowered demand was largely matched by lowered supply from foreign imports as well as the decades-long decline in domestic production. As I wrote previously, the decline in domestic oil production has been going on for forty years, transcending all perturbations of history, politics, party and economic situation. It has almost nothing to do with Obama or his policies. To assert otherwise in the face of the evidence is simply lying. And in fact, oil production has increased under Obama. Would we like to increase domestic production more? Sure, but only if it can be done at a cost, both economic and environmental, that we can afford. To hear industry tell it, the Gulf of Mexico (GOM) drilling moratorium has been a disaster. Even though it has ended, the carping continues, focused now on the so-called "permitorium", where permits receive more scrutiny and take longer to issue. 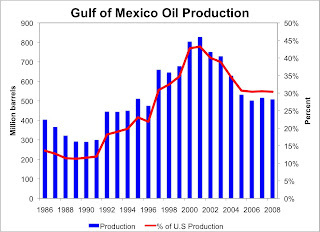 Production is indeed down in the Gulf, but again, the trends are not recent. While the EIA figures on production lag, the direction is clear: production has declined as the rigs have moved into deeper water and the costs and technical challenges have mounted. The number of rigs used by industry reflects this decline, and the Baker-Hughes rig count in the GOM, shows that the trend continues right up to the present. 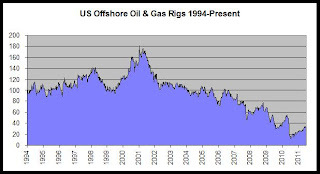 There is an obvious and sharp drop in 2010 when the moratorium was quickly enacted in response BP Deepwater Horizon fiasco. The count has quickly snapped back up, however in line with the overall trend. Threats and dire warnings that rigs would move away from the GOM are evidently over-hyped. If rigs are being redeployed elsewhere it again reflects a deeper trend that has little to do with the breathless rhetoric we hear currently. The oil industry has not earned our trust for us to uncritically believe whatever they tell us. 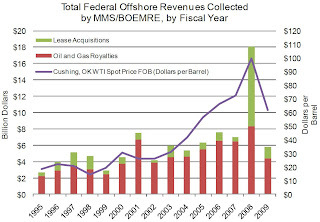 The royalty revenues from oil, while measured in billions, don't amount to much when we consider that we're currently borrowing more than $1T per year in the federal budget. Considering that the federal government also hands out nearly $10B a year in subsidies and tax breaks to Big Oil, the result is, at best, a zero-sum game. What our tax policy takes with one hand it gives back with the other in an arrangement that pleases no one even as it infuriates people on both sides of the political fence. To be sure, Big Oil employs lots of people, even if it sometimes seems too many of them are in public relations and lobbying. But many other industries are important employers too, and when it comes to creating jobs, the oil patch is not the most effective place to do it. Oil and gas create 5.18 jobs per $1M of investment, almost $200,000 per job. Meanwhile, the comparable figures are 12.46 jobs per $1M invested in the future electricity grid, 13.3 jobs per $1M invested in wind, and 17.36 jobs per $1M invested in biomass projects. Even better are the figures for conservation, infrastructure and public transit projects—all above 20 jobs per $1M invested—and sustainable forestry, weighing in at nearly 40 jobs per $1M invested. These figures, from Heidi Garrett-Peltier and Robert Pollin at the University of Massachusetts Political Economy and Research Institute, include indirect and induced jobs created from the expanded economic activity that the direct hiring stimulates. If Congress and the Administration are interested in using regulatory or tax policy to stimulate job creation, they could hardly get less value for the (our) money than to further cater to Big Oil. Drilling in the Gulf of Mexico does indeed have critical importance to the future. So does drilling in every other conceivable offshore location (if only the pro-drilling forces can somehow make that happen.) But whose future? The future of the ecosystems in which the drilling occurs is dimmer. If lucky, they will suffer only the usual small spills and on-going environmental degradation that is part of normal cost of business as usual for the industry. If unlucky, well, we've seen what can happen. The future bright spot? It will certainly have a significantly positive impact on the already robust profits of the oil companies and those who supply them. 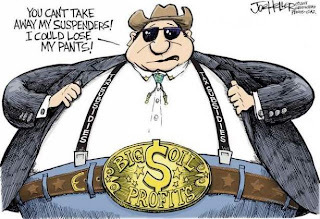 This is the real purpose of all the complaining: to further loosen regulation and oversight and allow an even more unfettered operation to generate even larger profits. Also benefiting will be those in Congress captured by the corporate cash which has become the lifeblood of their continued campaign operations and the currency of their political clout. Where Did the Oil Go?